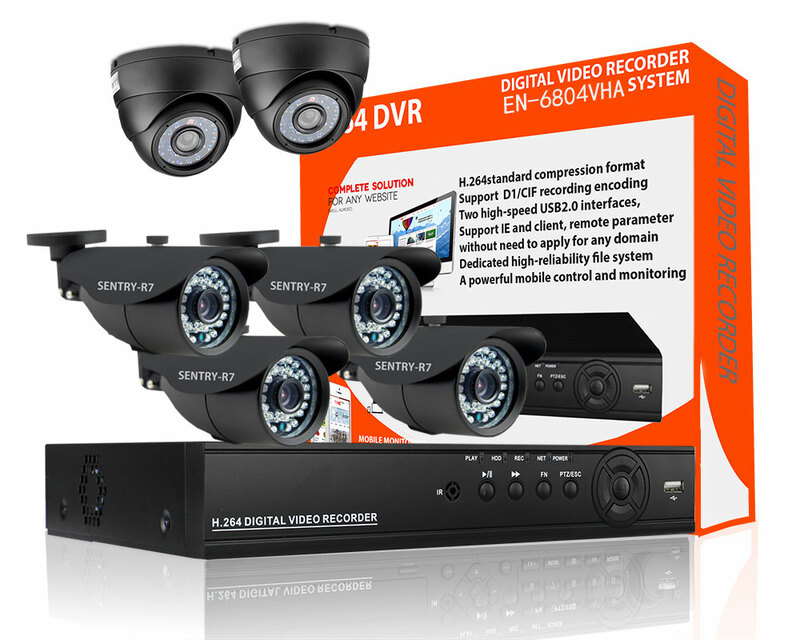 Intended for the house or office, Sentry’s EN-6008A 8-Channel DVR with 4 Indoor/Outdoor & 2 Dome CCTV offers you a whole surveillance kit to improve your security. 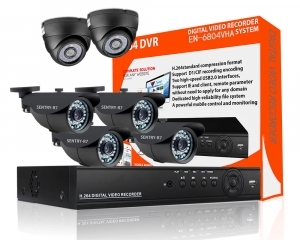 With this particular full pentaplex operation DVR, it is possible to simultaneously view the live feed, review saved files, program/edit the machine and camera settings, and remotely get access to it without needing to stop recording. persons are logged-in, while continuing to record. That is a significant feature for combating employee theft or even to observe care-givers in your absence. 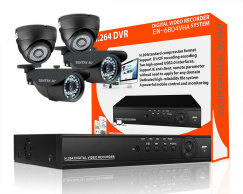 Complementing the DVR are 6 600TVL resolution cameras. These cameras could be mounted indoors for 24/7/365 surveillance coverage. 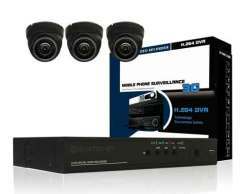 Both have 24 IR LEDs offering a night vision selection of around 20 meters, and their housings are IP66-rated to be dust and weatherproof for year-round performance. Digital Noise Reduction (DNR), and automatic White Balance and Gain assist in the image quality in low-light and in extreme lighting conditions. 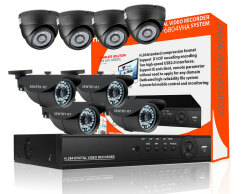 8 Channel DVR with BNC connectors. Simultaneous HDMI and VGA (4CIF) video output. Two USB 2.0 ports for mouse and/or external backup devices. Four audio In and Out RCA port. Supports two-way audio with microphones and a speaker installed. RS485 port for PTZ camera support with 127 pre-sets. 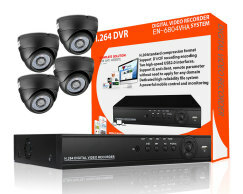 Control DVR with OSD virtual keyboard and included mouse or IR remote controller. Full pentaplex operation: simultaneously live-view, playback, program/edit, and record. 1, 4 sequential, and picture-in-picture display modes. 960H aspect ratio ensures images fit on wide-screen monitors and TVs. Efficient H.264 video and G.711 audio compression reduce bandwidth and memory use. Covert mode blocks camera from showing on live-screen to groups without permission to see it, but camera continues to record. Privacy mask zones block sensitive areas from live-view and recording. Back up files to local external device using USB 2.0 port or to remote NAS or computer. Manual: Start/stop recording; captures everything but fills memory fast. 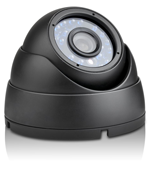 Video motion detection: Recording starts when motion is detected. Adjustable zones and sensitivity. Time Lapse: Program system to capture a single frame at pre-determined intervals. Schedule: Program when recording or events will be eligible to be captured. Programmable Holiday schedule for days outside normal schedule. Pre-Alarm period from off to 5 seconds. Up to 6 hour Post-Alarm period: 5, 10, 20, 30 second. 1, 3, 5, 10, 20 minutes. 1, 2, 3, 4, 5, 6 hours. Recording settings like resolution, quality and frame rate configurable per-channel. Events that trigger alarms/notifications: System on/off, video loss, HDD full/failure, Manual recording start/stop, change passwords. Compatible with Windows, Mac OS and Android/iOS mobile devices. One administrator, up to 10 groups with up to ten users per group. Grant/Deny group permissions per function including remote accessibility. Automatic remote notification via e-mail. Maximum number of remote users: Search-2, Live Unicast-4, Live Multicast-20. Files can be saved to remote NAS or computer. Screen-capture from remote computer and save file. mobile app for Android/iOS devices supports audio and PTZ functions. 3.6mm f/2 lens and 72° field of view. 24 IR LEDs with 20 meters range. Digital Noise Reduction (DNR): Filters video ‘noise’ for sharper images in low-light with better contrast while reducing memory usage. Automatic White Balance and Gain for improved image quality in low or extreme light conditions. Mobile Phone Support Window Mobile, Symbian, Android, iPhone, Blackberry etc.